Almost 1000 compounds have been identified in roast coffee extracts, with chemical composition varying due to a number of factors, such as coffee bean origin and degree of roasting. The overall flavour and aroma of coffee results from the combined presence of chemicals from a number of classes, including hydrocarbons, aldehydes, acids, esters as well as sulfur- and nitrogen-containing compounds. Nitrogen-containing compounds – including pyrazines, pyridines and thiazoles – are of particular importance to the aroma of roasted coffee. Comprehensive two-dimensional gas chromatography coupled with time-of-flight mass spectrometry (GC×GC–TOF MS) is ideal for the analysis of such complex samples, because the enhanced separation capacity allows analysts to screen the entire composition in a single analysis, with confident identification of compounds that would ordinarily co-elute. In this study, we show how this capability enables companies in the drinks industry to ensure that their products meet all quality assurance criteria, and that the taste and aroma expected by consumers is consistently maintained. Three green coffee samples (obtained from different regions of South America and roasted in Italy) were analysed in this study. Extracts were prepared using liquid–liquid extraction from the brewed coffee into dichloromethane. The coffee samples were analysed using a semi-polar to polar column set for optimal separation of the various polar constituents, including numerous classes of heterocyclics. To overcome the difficulty of finding trace-level aroma components in these complex samples, simple scripts were created to identify key sulfur- and nitrogen-containing compounds, including pyrroles, pyridines and pyrazines. 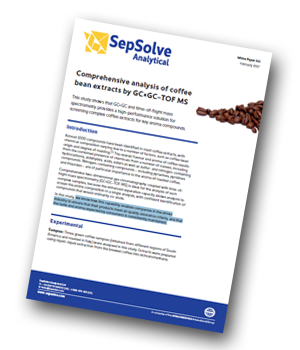 In this study, we have shown that GC×GC with BenchTOF offers the detailed sample characterisation needed to ensure that the quality of coffee products is maintained from batch to batch, and that undesirable deviations are quickly flagged. In particular, compound separation was far better than would be possible with one-dimensional GC–MS, drastically reducing co-elutions and so allowing confident identification of the widest possible range of key aroma components.